How I wound up in Key West- I grew up in the Chicago area, and played in a lot of garage bands during high school. My first gig was at a sock hop at St. Viator's High School, opening for Ted Nugent's band (he was a sophomore there at the time). I attended the DePaul University School of Music, and studied classical guitar with Jack Cecchini. Jack was (and is) a brilliant musician and educator who played with Harry Belafonte and Peggy Lee at the peak of their fame. I earned a Bachelor of Music there. After that I spent most of the 70's playing bass in show bands (where the money was), and touring the eastern U.S. We played in Florida a lot, and I wound up back in school at the University of Miami. I got my Master's degree in bass from the U.M. jazz program, and took a job playing on the cruise ship Nordic Prince. That's when things really changed. Though I got to work with many fine singers and musicians, it was easy to see that the ship's steel band was having all the fun. I spent seven years exploring the islands and learning the music. I knew that Calypso, Soca, and Reggae was what I wanted to play. 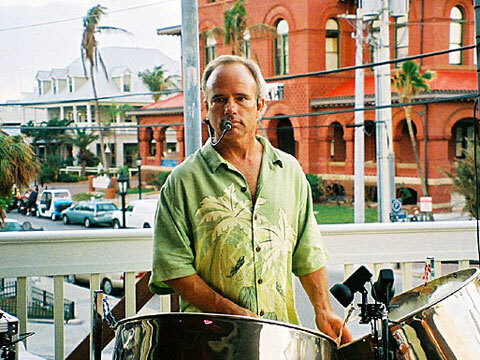 I moved to Key West in 1988 because I saw that it was a place I could make a living playing Caribbean music. I taught myself steel pan, and people say that's what they want me to play. I won't argue.